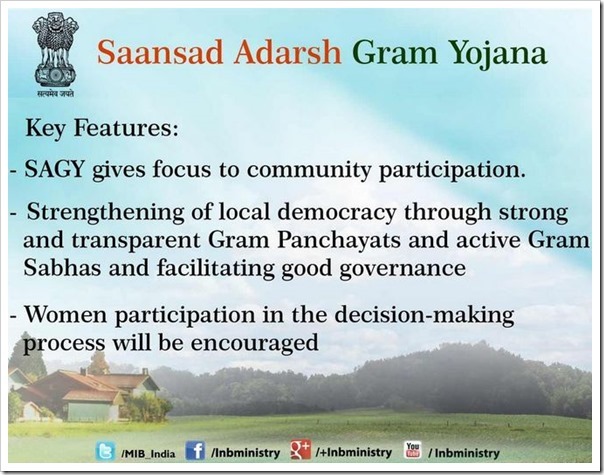 In a view to get the rural India back on the map, Honorable PM Modi launched “Saansad Adarsh Gram Yojna” on October 11,2014. The uniqueness of this scheme is that it has been outsourced it to MP’s. Yes, now a MP can choose 3 villages of his choice and work with people to make his village an “Adarsh gram” or a model village. We all know that if there’s anyone who’s neglected after polling and worshipped before polling, it’s that part of India that supplies us with food but dies due to debts- The Farmers. These kind of schemes will induce a sense of belongingness for the rural youth and will encourage MPs to think out of the box to make the villages more greener and more productive. This scheme can breed the best minds if implemented and done. Launching this model programme on the birth anniversary of Lok Nayak Jai Prakash Narayan, it’s Modi’s style of paying tribute to yester year’s activists and leader’s ideologies. Like Swacch Bharat Yojna on Gandhiji’s birth anniversary as cleanliness was close to Bapu. The same way, Jai Praksah, coming from a upper middle class background, was a very well educated man and pursued higher studies in California. To pay for his education, Jayaprakash picked grapes, set them out to dry, packed fruits at a canning factory, washed dishes, worked as a mechanic at a garage and at a slaughter house, sold lotions and taught. All these jobs gave Jayaprakash an insight into the difficulties of the working class. Once back to India, he was a freedom fighter who wanted British out of India and reformer after the British left. In tribute to his ideologies and dogma, looks like Modi was right in launching the yojna on his birth anniversary. However, Modi had to select the villages in Varanasi but UP BJP spokesperson has reported that PM seems to have postponed the visit. A fresh date is yet to be announced. We just hope he chooses a barren land that can bear fruit if given the respect and care, so that other MPs can be shown how it is done. What do you think about this initiative by the PM? Do let us know in comments. Economic Freedom of States In India: Gujarat Tops, Bihar Least!